This note describes the WheeStat kit and how to put it together. More information on the WheeStat is available on the User's Manual wiki page, found here. All the stuff shown in the main image should be in the WheeStat kit. This includes; (1) a vhs tape box which is used for an enclosure. 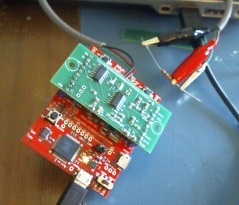 (2) A Tiva LaunchPad development board (the red circuit board). (3) An analog circuit board (green board). (4) Three alligator clips. (5) A micro usb cable (6) A three conductor cable. (7) Two headers for connecting the boards (blue things in the lower left corner), (8) Stuff for making a silver / silver chloride reference electrode, (9) two graphite rods and electrical tape for working and auxiliary electrodes, and (10) a 1 GB usb flash drive with the most up to date code (as of when your kit was shipped from NC). The first thing you should probably do is put your reference electrode together since it will take a while to equilibrate. Inside the 15 mL conical tube you should find a glass tube, a bunch of ceramic beads, a rubber septum, and a silver wire. Don't lose the wire. It is not just silver colored, it is the actual metal, silver. It's not like it is ridiculously expensive, but you don't want to have to order another one. To make the reference electrode, follow the instructions found here. Inside the tube, you should also find two pieces of graphite rod. Those are your low cost working and counter (also called auxiliary) electrodes. you will want to wrap those electrodes in colored electrical tape to insulate them. To make the WheeStat shield, you need to solder the headers to the green board on the far right and left, and solder wires for the three electrodes to the wire pads in the lower center. Prepare the three conductor cable by stripping the gray insulation off about 3 inches on one side (for the alligator clips) and 1 inch on the other side (to connect to the board), exposing the wires inside> Then strip 2 to 3 mm of the red/green/black insulation off of the individual wires. As shown in the figure above, the green wire is soldered to the left wire pad, the red wire goes in the center, and the black wire goes on the right. I like to mount the headers on the LauchPad (red board) first, then place the green board in place and solder the headers to the green board. This keeps everything square, but be careful not to go overboard with the solder or you may end up soldering the LaunchPad to the headers as well. Once the wires and headers are on, it is time to attach the alligator clips to the other side of the wires. To remove the insulating hoods from the red and black alligator clips, first clip them onto something soft, like an extension cord, then slide the hoods off. Put the red and black hoods on the red and black wires and attach the clips to the wires. I push the bare wire through a hole in the clip, crimp the clip to the insulation and fill the wire/hole with solder. While the clip is still attached to the extension cord, slide the insulating hood back into place. Now you need to install the drivers and the GUI files on your computer. Instructions for downloading the drivers from Texas instruments is (here).The GUI files and the source code for both the GUI and the microcontroller program will be on the flash drive that comes with the kit. Copy the folder containing the application file (.exe) and the folders containing the source code, the libraries, and the data files to your computer. Double clicking on the exe file should open the GUI. Note that more recent versions of the software may be available by the time you get your kit. If so, they should be available from our GitHub site. There is a little more information on this here. When will kits be available? Great! is there a wiki page already, Jack? I'd like to move this over there so when I replicate the instructions with a kit I can add some details/photos/illustrations. Awesome! thanks. Can't wait to play with the Wheestat! I'm trying to source the components locally but can't get the Stellaris eval-board here in Europe. According to Farnell, they're not being manufactured anymore. Are there alternatives? Hi Leroy, The Stellaris was replaced by the Tiva boards. The code is compatible with both boards. They can be purchased for $13 direct from Texas Instruments (http://www.ti.com/tool/ek-tm4c123gxl) or from Mouser. Other vendors I have seen mark them up more. How can I order the kit? Thanks. Igor. Thank you very much Jack. I placed the order. Where i can find the specification of the Wheestat? Maximum and minimum currents, voltametry step and etc. Have a nice weekend. Igor. Hi IgorS, Sorry about the slow response. Things get really busy for me this time of year. Thank you very much for explanations. I would like to test electrodes for supercapacitor, and assambled supercapacitors (~0.5 to 20 miliF). May be I will use the WheeStat as controller for electrochemical deposition. 100 mv\sec is enough for my tests for now. I think we will be required to adjust voltage step to make measurements more smooth, but it depend how many current sample can be measured per step and time offset of the measurement. I guess that in fast response systems the current inside a time frame of steps is not distributed equally. Thanks again. I. Thank you very much,i will test it by myself.then i will buy graphite rods on china graphite suppliers.if any question,i will connect with you. thanks again! Hi, @JSummers -- can you link to the board files for the circuitboard? I see a Github link but can't quite read it in the photos. Hi @warren, I had never did put the board files online before (Sorry). 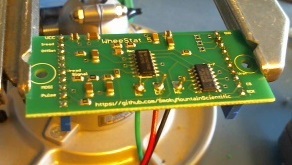 I just made them available at https://github.com/SmokyMountainScientific/WheeStat5Eagles. Anyone wanting to make one of the 5 series boards themselves from the pcb can buy them in sets of 3 at this url: https://oshpark.com/shared_projects/yepeXPFo.